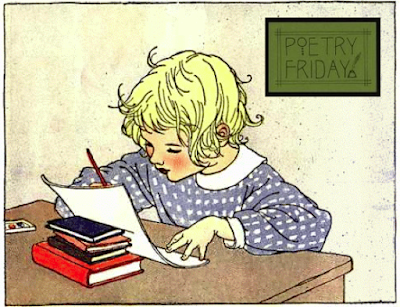 Hello, hello, hello... and welcome to the Poetry Friday Roundup! I'm grateful to be hosting smack dab in the middle of National Poetry Month. With so many wonderful poetry projects to delight, amuse, inspire, and entertain, thanks to Jama Rattigan for her 2016 National Poetry Month Kidlitosphere Events Roundup to keep track of them all. If you're new in these parts, Renée LaTulippe has everything you need to know about Poetry Friday HERE. "Alter Echo" is my contribution to April's Ditty of the Month Club (DMC) challenge, courtesy of Marilyn Singer. She encouraged us to write poems inspired by the word "echo." If you missed my spotlight interview with Marilyn, you can find it HERE. Other poems featured this week were by Jessica Bigi, Linda Baie, and Robyn Campbell. 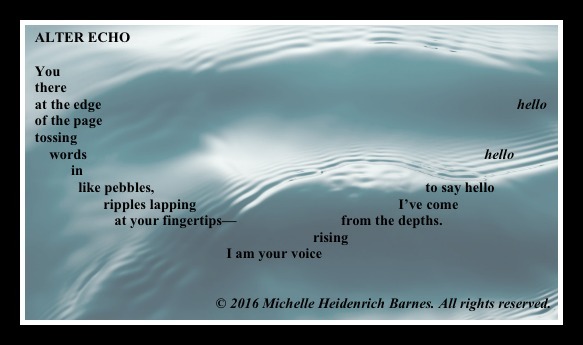 Thanks also to cbhanek, Liz Steinglass, Violet Nesdoly, and Amy Rudd for posting "echo"-inspired poems at their own blogs. I hope you will consider writing one yourself! Send your poem to TodaysLittleDitty (at) gmail (dot) com, or use the contact form in the sidebar to the right. 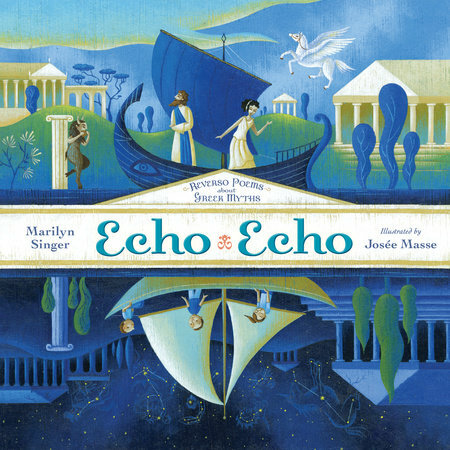 All contributions will be included in a wrap-up celebration on Friday, April 29th, and one lucky participant will win a copy of Marilyn Singer's ECHO ECHO (Dial Books, 2016)— a fantastic new collection of reverso poems based on Greek Myths, gorgeously illustrated by Josée Masse. "This collection really ought to be made into a book." "Wouldn't it make a nice anthology?" "I want to keep them all in a notebook for savoring." "You've posted a whole, beautiful anthology here." 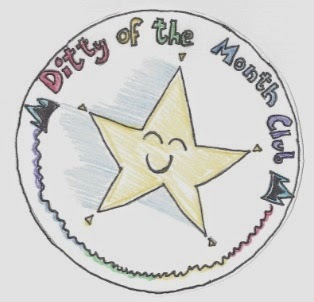 Why should my blog be the only place to enjoy the Ditty of the Month Club? It's time to share the joy! That's why I'm planning to put together an annual "Best Of Today's Little Ditty" ebook collection, with the option of print on demand for those who would like to keep a copy on their shelf or bedside table. In order to do this, however, I need help. Lots of help. If you're interested in being on a committee—we'll call it a "ditty committee"—to help shape the anthology and decide which poems should be included, please contact me via email, contact form, or in the comments (and include your email address if I don't already have it). I'm really excited about this new undertaking and the opportunity to work closely with several members of the TLD community! Now who's ready for a roundup? Please leave your link below. I look forward to making the rounds of this week's offerings! celebrating student work and a sunflower fib. I like your poem, Michelle, no matter which way I read it, straight across the center or down and up. It has a lovely echo to it. The ebook sounds exciting! I'm afraid I've never self-published, so I don't know how much help I'd be. I do enjoy your collections, though, very much! I'm not looking for folks who know how to self-publish, Brenda– more of a review panel/sounding board. If you're interested, let me know. "Alter Echo" is a delight to the ear and the eye! I have an echo poem, but I needed a picture to go with it. I found something on eBay and I expect delivery next Tuesday. I'll send a jpg to you some time next week. Your project sounds like fun--count me in as a helper. Thanks, Diane. Looking forward to your jpeg! Michelle, that echo poem! I love the way you used form to communicate movement and drama. I'll be away next week, celebrating Poem in Your Pocket Day (4/21) at Emerson ES in Albuquerque! My Poetry Friday post is a list of five ways to celebrate with your children or students. Excited to hear about your plans to do a TLD ebook! At Alphabet Soup I have a review of Will's Words by Jane Sutcliffe and John Shelley + a recipe for 1610 Rose Cakes + Mr Cornelius's Shakespeare-isms + a giveaway. Jumping right into your alter ego reflecting pond after you: Yes! Hello, hello, hello...Thank you for opening your site to another memorable PF gathering--graciously accommodating early jump starters. I love the image of word-ripples, rising from the depths, surfacing to where writer and reader can be imbued by them. Thank you, too, for this week's DMC echo poem shout-out, and a most special congratulations and thank you for the exciting DMC anthology announcement. 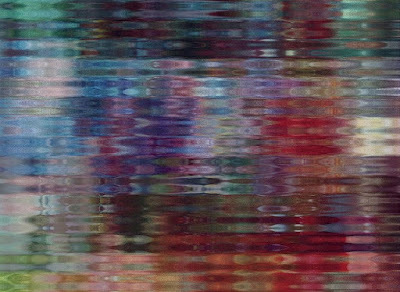 What a wonderful gift to look forward to treasuring...ripples upon ripples...voices upon voices...solitary reflecting ponds coming together, overflowing, filling the world with oceans of poetry. God bless you. Thank you! Love both the look and the sound of your "Alter Echo," Michelle! And what a wonderful idea to create an anthology of your DMC poems. Great poem, Michelle - lovely presentation, too. Good luck with your ambitious project! What a beautiful visual poem, Michelle! And good luck with the compilation! I had some similar comments about 15 Words or Less Poems over the years, but I was never brave enough to attempt it, with the logistics, the choosing, the permissions, etc. I think it's a fabulous idea, though, and it will be a great result of the lovely poems you've midwifed here! I often feel as if I'm "tossing words in like pebbles", and hoping the "echo" is pleasant. Your poem is lovely, and the presentation too, Michelle. How wonderful to try to put together a group of TLD poems. They are always amazing, I agree. Thanks for your continuing enthusiasm and hosting too! I have a reflection poem today, a look at romance. You have described my writing process many days! Love the poem and the images you chose. Huzzah for an anthology! Good onya! Aspiration in action!! Your poem is clever and beautiful, visually and creatively. You must be delighted with it. LOL... things are already crazy busy, Kat, so what's a little more, right? I love the way your poem looks on the image as well as the idea of our voices echoing here on Poetry Friday. Your dedication to this community is showing in your new ebook project. Your echo poem is beautiful. The photo and and layout add so much. A TLD collection sounds great. I do love reading the wrap-ups! Hi, Michelle, and thanks for hosting. I LOVE that you're launching a new anthology yourself-- YAY! Go for it! Your poem is absolutely fabulous, especially when presented in that arrangement with that photo. A stunning whole! Thanks for sharing and for hosting this week and good luck with your ambitious new project! Michelle, did you notice that your poem works very well if you start at "hello...and work backwards. The first two lines would just need tweaking and it would be perfect! I love reading it backwards. Changes the meaning - ever so subtly. I have never been on a screening committee unless it was to hire a new teacher, but I love poetry, so I would give it a go. Let me know if you need me! I'm on the letter M today with a Vanity Plate Poem! Thanks for giving me new perspective on my own poem, Donna! I swear your brain must do creativity calisthenics. :) Thanks also for offering to help out with my new venture! Love your echo poem, both the words and the presentation. Nice imaging. Congratulations and poetic blessings on your ditty committee and the whole project! Love that echo poem, Michelle! Love the visual, too. Thanks for hosting this week! The marriage of your poem and the image is perfect! What a lovely poem, and so perfect for this Poetry Friday and your celebration! Congratulations on the new project. You have created such a warm community of sharing here. I so love that your poem is like a visual echo, Michelle! Very lovely! Thanks for sharing!! Thank you for hosting, Michelle. Wonderful poem about voice! I love the presentation and message and especially enjoy "tossing words in like pebbles." I look forward to hearing more about your exciting new project—good luck with it! 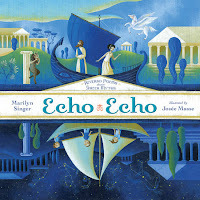 Love the book Echo Echo and Mirror Mirror - both same format. I am always amazed at the kids who just take to this format naturally. We are blogging about these books later this month o #IMWAYR. Amy Rudder tried one today and it was great!! Your poem and photo are both breathtaking! Great, Clare! I saw Amy's terrific post. If you, or anyone else, is inspired to write an echo-inspired poem, tag me (@MichelleHBarnes). I'll include the poem in the wrap-up and enter you in the drawing at the end of the month. Thank you, I was inspired by your post! I would be happy to have the reflection poem in the echo collection. I also enjoyed thinking about the poem you created. Hello, hello, hello! I read your poem again and again! I love it because it is so true about the way many of us write. Lovely work, Michelle! Good luck with the e-book! Lovely imagery, ripples and words!!! Deep and fun, no pun intended. Michelle, I heard Marilyn Singer read poems from her book, Echo Echo. It was a wonderful session ending session for NCTE 15. I enjoyed your little ditty poem reflecting the word echo and especially liked the format. I would like to try to compose one. Love your alter echo poem! Thanks for hosting, Michelle. Your upcoming project will be a gift to this community. Can't wait to see the finished product. Not a problem, Jone. I added your links at the end. Lovely words and art - two different kinds of echo, sound and sight. Michelle, an echo poem I can see and hear. It's absolutely beautiful. Your carefully chosen words are so visual. Especially, ripples lapping at your fingertips. Fabulous job. Michelle, what a beautiful poem. It flows like a rippling echo. Lovely!